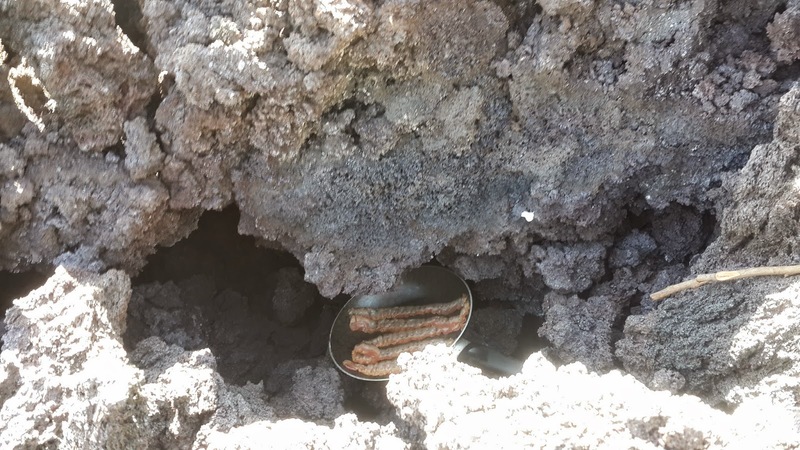 Roaming the Countryside: Volcano Fried Bacon (Move aside KFC). 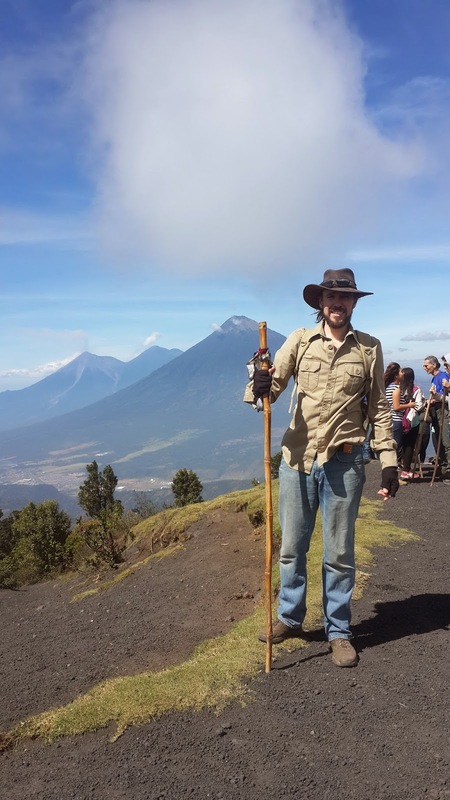 This was my sixth trip up Volcano Pacaya within the past year. Typically I take a horse, but this time I wanted to walk it. This meant that I needed to pack wisely. My pack included: a hatchet, a first aid kit, and Ace bandage, two jugs of water, a multi-tool, some fruit and nuts, a frying pan, and a pound of bacon. I've always wondered if it was hot enough to cook. There are shafts that run up through the depths of the volcano where heated gases escape. The vapor splits through the molten lava as it cools and hardens it into vents. I've had my shoes melt around an entrance to a vent before, so I thought there might be a chance I could fry some bacon. Skip is a buddy of mine that worked as a teacher last year in Cambodia. His heritage is Native American and I find him to be a deeply spiritual person. While we have quite a few differences, it's the commonalities that have drawn us together. 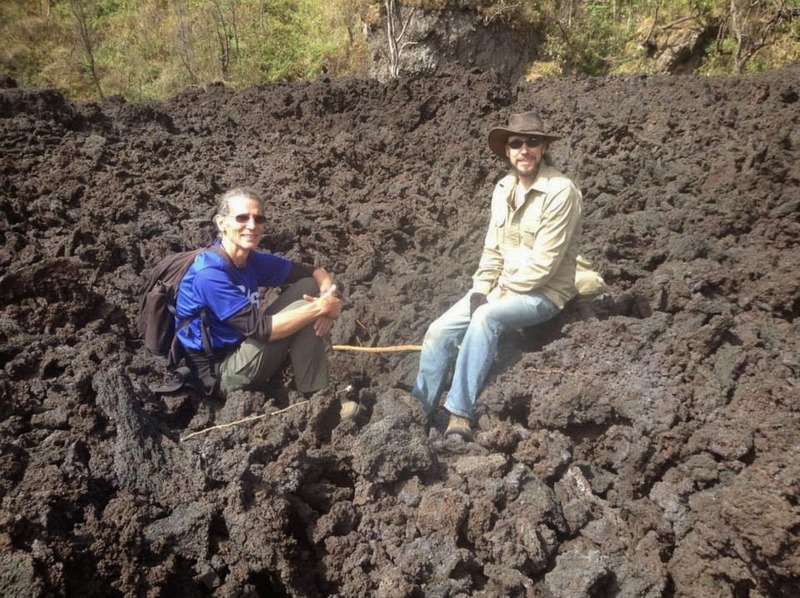 We sat in a lava field together for a good long time, and we had some pretty amazing conversation. Skip didn't know about the bacon though. He knew I was searching for a vent, and he found one that was the hottest I'd ever felt. Skip has done extensive hiking, climbing, and traveling. This past year he climbed Everest. I figured I'd be pretty intimidated climbing with Skip, but it wasn't that way. His careful and relaxed demeanor made the day feel... somehow authentic. I joked, "I wonder if this is hot enough to cook bacon?" He replied, "I bet it is." I smiled and then said, "well then, let's try it." I removed the frying pan and then a box of bacon out of my pack. His reply, "you've got to be kidding!" Skip held the pan while I unwrapped the first layer of bacon. Leaning down through the top of the vent, I held my breath and lowered the pan into the heat. It was intense. I could feel it burning up through my shoes, and scorching around my gloved and wrapped hand. I was leaning into the space, pressed against the opening to keep from falling. The bacon sat about 3 feet into the opening and in less than a minute it began to sizzle! 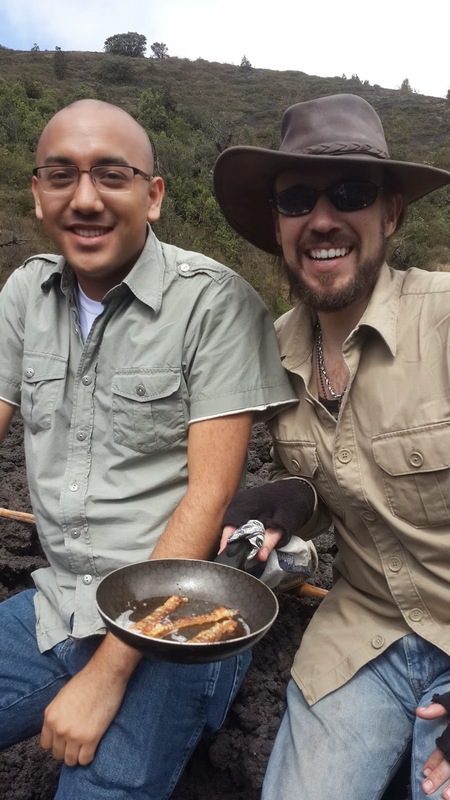 We were thrilled, we would soon be eating bacon on the top of a volcano, about 2 miles above sea level, in Guatemala. In case you don't know, it's difficult to get bacon in Guatemala. This particular bacon was hand delivered by my mother-in-law from Cincinnati. 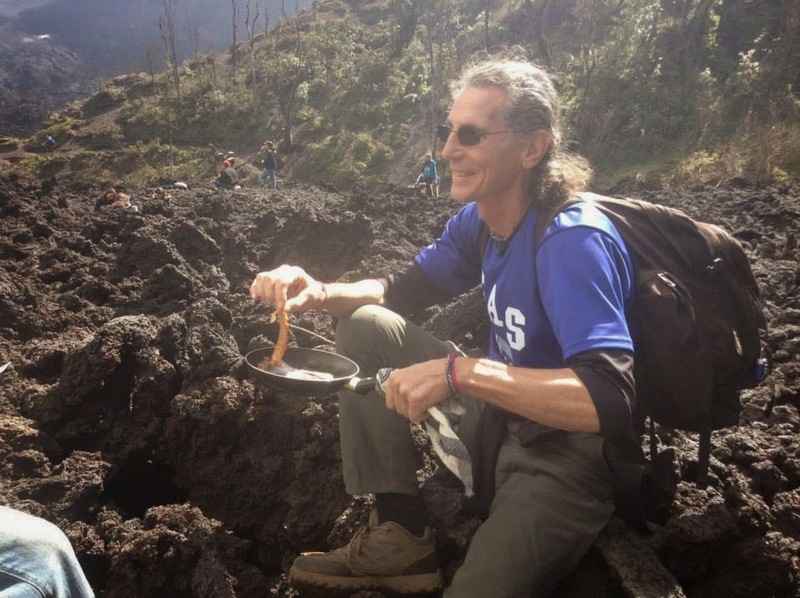 I'm not sure if it was the mouth-watering smell of bacon frying of volcanic heat, or if he was led by God, but over walked my Guatemalan friend Otto. What an incredible moment. I laughed to myself as I thought, "A Gringo, a Native American and a Guatemalan were sitting atop a volcano." Surely this must be the start of a good joke or story? Otto showed up on the day we launched our church in the city. He walked in, shook my hand and said, "My name is Otto. I found you on Facebook. Can I help?" He sat up chairs that day. Now he is my right hand. He advises me on cultural issues and he manages all media for the church. So there we were. 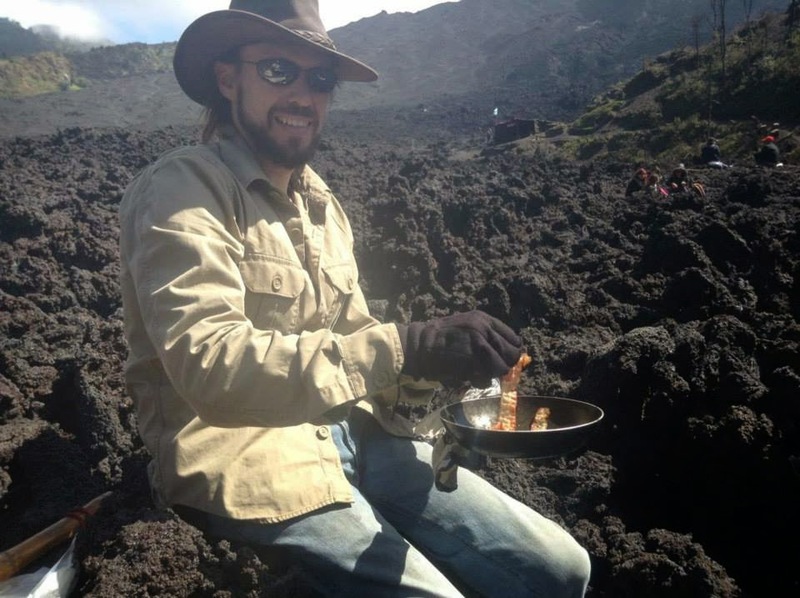 Three very different cultures and heritages, sitting on a volcano as I lifted out a pan of perfectly cooked, golden, crisp bacon. As we reached into that bubbling hot pan with our fingers, dripping hot grease, and enjoying each crunchy bite, something bigger than us somehow happened. Suddenly we were sharing the food from all of our packs. A peanut-butter and jelly sandwich was torn, a cookie was split, and marshmallows were passed around from an old stick we found. We no longer were different at all. We were just three guys having lunch. It felt like we'd been friends forever. It was silent up there. And in the silence we all could hear the wind whispering through the field of petrified lava. We noticed the hawks circling the sky and commented about the barren landscape that was again finding life. Lichen and moss were giving a foundation for growth. Soon we were talking about the passage of time, family, the perspective of aging, the nature of time, and then eternity, heaven, and the nature of God. We we just three created beings, sharing a meal in a crater of an active volcano, contemplating our place in the universe. It was no longer about our differences. I know we all grew a little this day. I know that I gained a new level of respect for two men that I now view as brothers. I wonder what my days would be like if I had more of this perspective? It's so easy to be negative in this world. It's so easy for us to see what is wrong. What if we spent more time sharing meals and finding commonality? Now sure, tomorrow I'll be standing behind the Bible and preaching to a church, and Otto will be in the back making everything look and sound good. And that's as it should be. But I also know that I have more questions than answers in life and I'm comfortable with that. Somehow the questions make it feel authentic and precious. Yeah, I have questions. But I also have answers. I know for sure that I don't want this to be my last excursion with Skip and Otto. We're talking about a 5 hour trek through the thick jungle above Tekal. There is a Mayan ruin there that few ever see. I think we'd have some time for some interesting conversation. I'm sure we'd share some meals. I wouldn't be surprised if we could even find a place to fry some bacon.